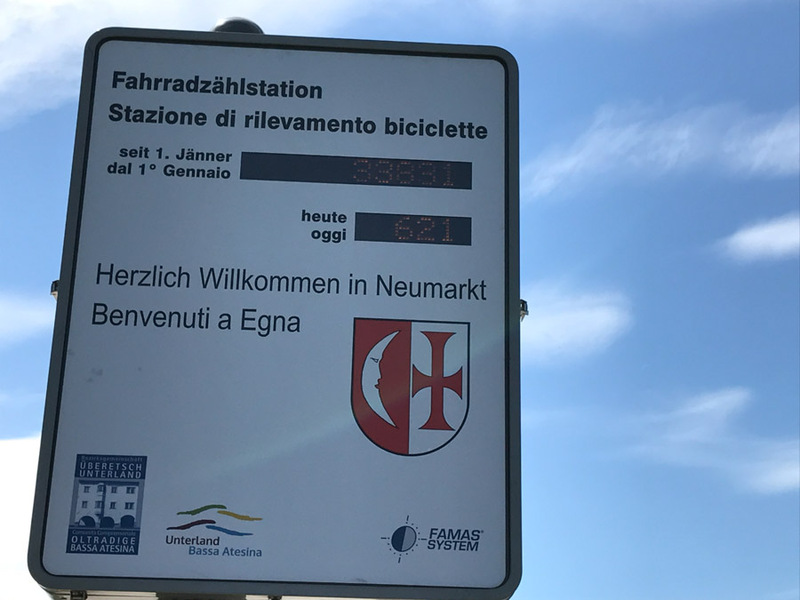 What would you say if I told you that from the Dolomites to Lake Garda you can stay on a continuous cycling path for approximately 180 km? Believe it or not, it’s actually possible! Now try to image the scene …. 180 km without cars, meeting and greeting only fellow cyclists on the way. Oh, yes – you might also collect a bunch of wheelsuckers on the way south! That said, Dolomite spring weather is fluffy (well, maybe spring is like that in the rest of the world, too). It’s like a song with a catchy refrain: it keeps coming back the same every year. At the end of March we always get 10 days of beautiful warm weather. 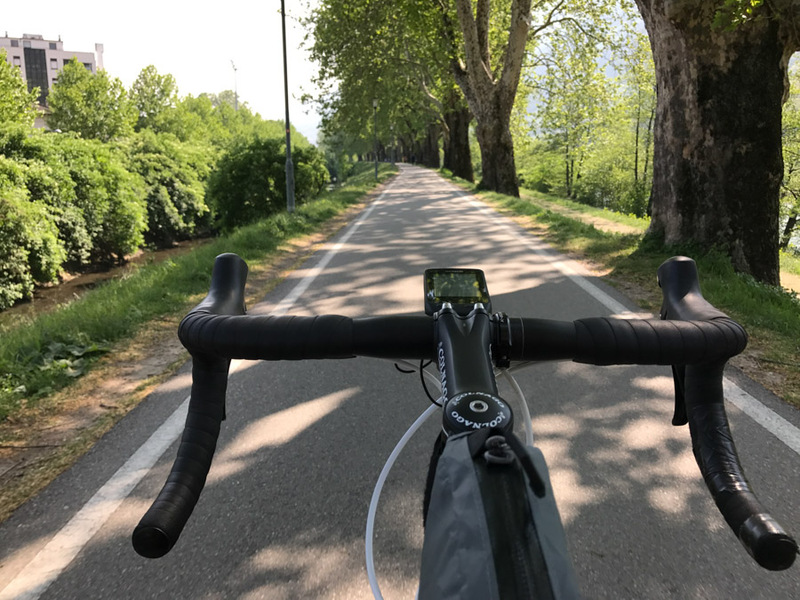 On some days, you can cycle in shorts and get your first tan line of the season – on others, Mother Nature wants to show you who’s the boss: this is when locals plan their road bike pilgrimage to Lake Garda. Why cycle from the Dolomites to Lake Garda? It’s the nearest place to the Dolomites with lots of water and it’s the perfect excuse in spring to leave the snow-covered Dolomite peaks behind after a long winter season. Even if the distance might be daunting, it’s not extreme or particularly hard. Just think: you’ll be going south and that means it goes downhill all the way! And, if you’re lucky to have a couple of friends driving a car, you won’t need to carry any backpacks on your bike. As mentioned above, riding this cycling path is amazing! 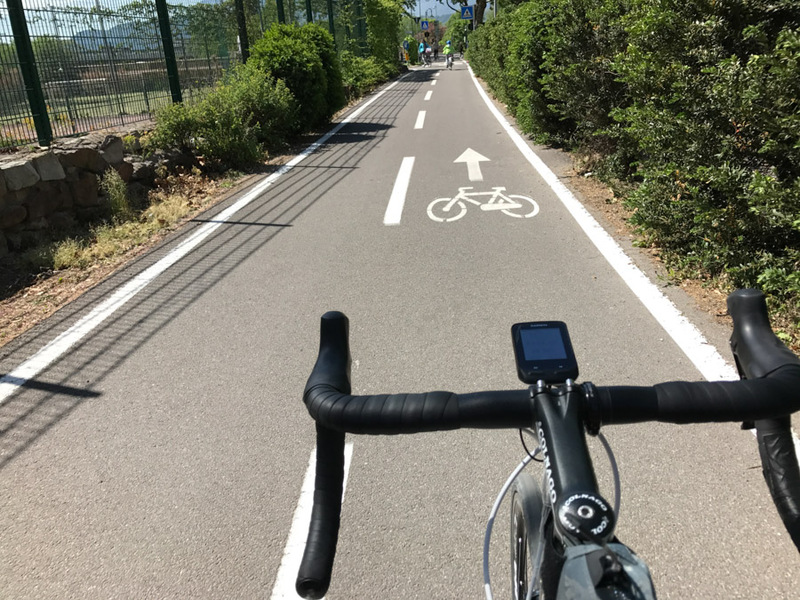 Just 22 km into the ride, starting from home, I’m already on the cycling path – and, I’ll be off it when the cycle computer shows me I’ve ridden over 200 km, on the north shore of Lake Garda, just before the town of Torbole. 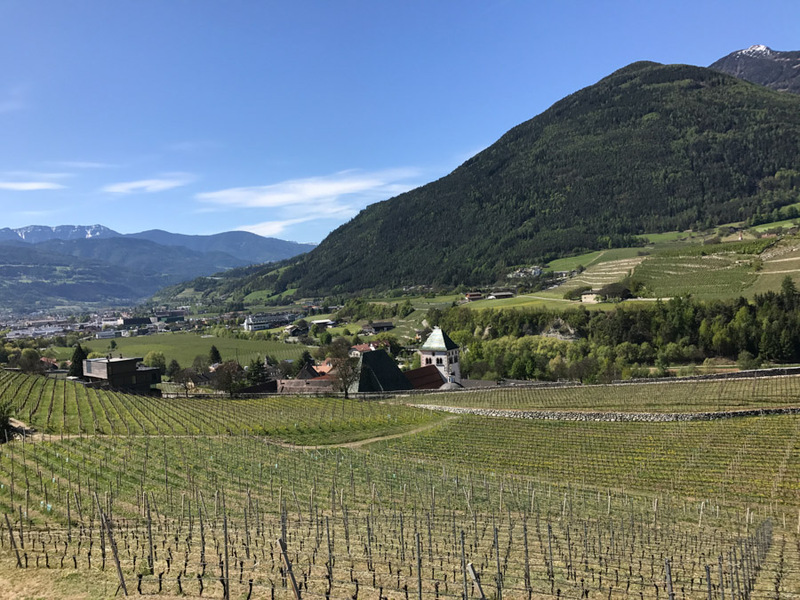 The infrastructure on the South Tyrol and Trentino cycling path is simply unbelievable! Need water or need to stop for lunch? No problem! At regular intervals, you’ll find a reststop with benches and a water fountain. But, wait! There’s more: you’ll also find “Bicigrill” bars & restaurants on the way! These bike stops are making such a profit. Just think that over 180,000 cyclists ride this cycling path annualy. If you take away the 4 winter months when there is less activity, on a warm summer day there can be more than 3,000 people riding it – and you can see that from cyclist encounters along the way. That said, this stretch will be like being in a cycler’s heaven: you start off riding through apple plantations that soon transform into neverending vineyards as soon you reach the Trentino region. 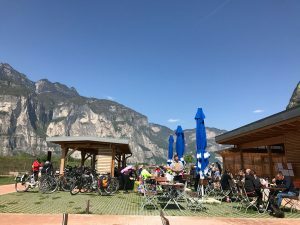 Luckily – since you may not be used to this solitude – on some parts, the cycling path rides along a nearby road or under a bridge, so you have proof that you haven’t been transported to a parallel world. All this makes the second reason a non-problem. This enemy has a name: Ora (literally translated it means “hour”). I’ve cycled from the Dolomites to Lake Garda on all kinds of road combinations, over 30 times (sometimes twice or more a year). 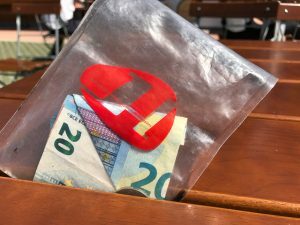 Even if this version is the longest one, on average 35km/h, it’s the best one because you won’t burn out riding the Dolomite passes at the beginning; and, this way, when you encounter the Ora wind, you won’t be tired. There are scientific publications about this wind, if you are interested, that can be found here and here. As soon you reach the town of Torbole on the north shore of Lake Garda, you may see plenty of windsurfers and kitesurfers taking advantage of this wind - a great plus for those sports but not for cyclists. It’s easy to find yourself riding what should be downhill at 20km/h – while you see other cyclists coming the opposite way, easily speeding uphill at 40 km/h. But, that’s part of the game and the adventure. If you plan to cycle from the Dolomites to Lake Garda, also consider where you plan to stay at Lake Garda. I have a preference for the south-east shore of the Lake, with favourite places between the towns of Bardolino and Lazise. 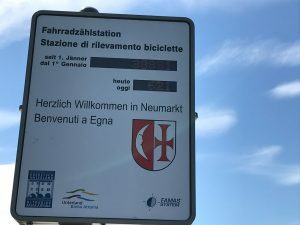 This means an extra 50 km ride as soon as you see the northern shores of the Lake in Torbole. But extra kms may not be such a problem. The sight of the lake makes everything easier once you know you’ve reached your goal. Last but not least, you’ll be back to sharing the road with motorized vehicles and – it might sound strange – but it’s nice to see them again after such a long time without them! 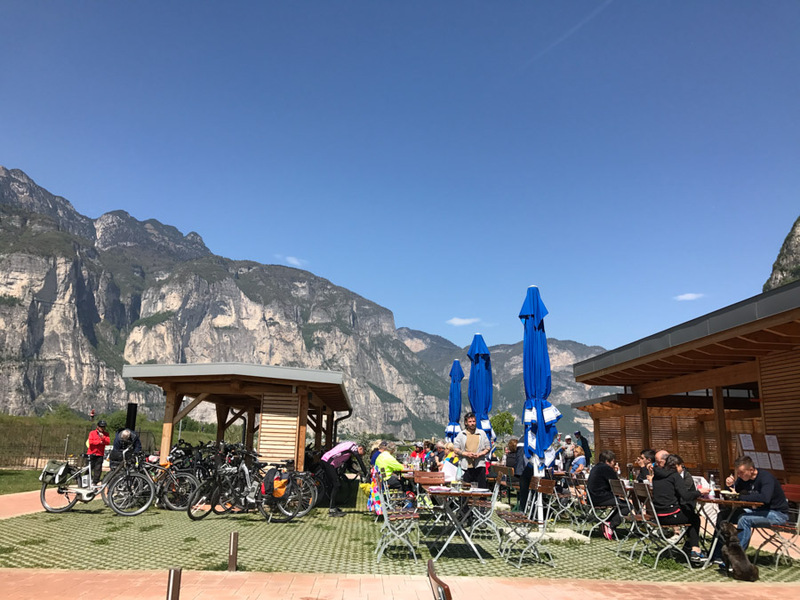 On request, tour operator Holimites organizes supported and un-supported rides (with baggage transfer) for all cyclists that would like to try this adventure cycling from the Dolomites to Lake Garda.